If you’ve never been to the Grand Canyon, you really need to go. No seriously, like RIGHT NOW! 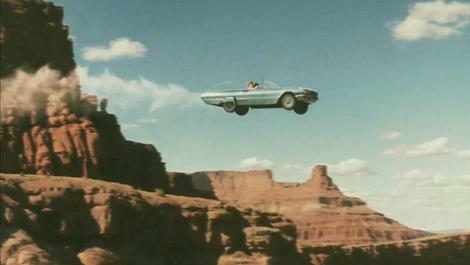 It doesn’t matter that we’ve all seen it in countless photos, videos and movies, including the iconic final scene in Thelma and Louise. It’s truly a magical place that’s beyond description and to see it in person will blow you away. My original intention wasn’t to go to the Grand Canyon on this trip. The plan was to relax and do some bird watching in southern Arizona. 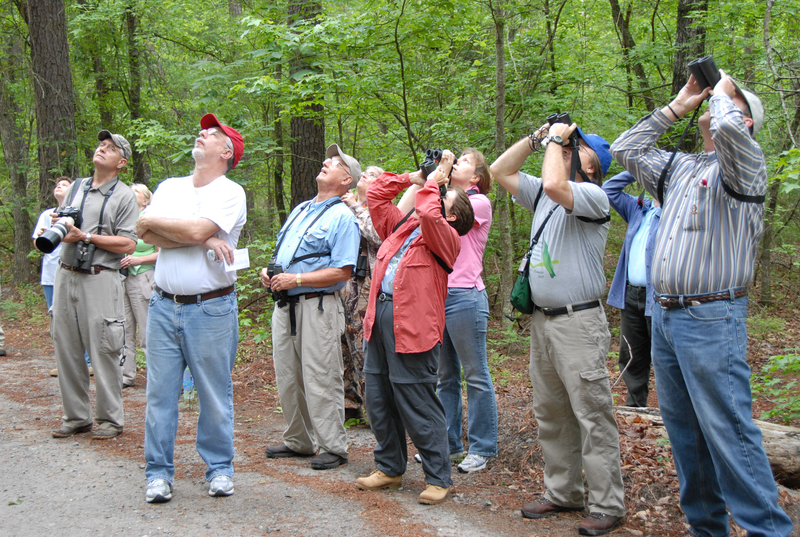 I’d discovered birding a few years ago and found that it’s a nice complement to my love of nature and travel. Plus, it’s a very civilized activity for a middle aged dude such as myself. But this plan changed when I bumped into the owners of Animal Athletics. They had just gotten back from doing the Rim to Rim to Rim (R2R2R) in the Grand Canyon. 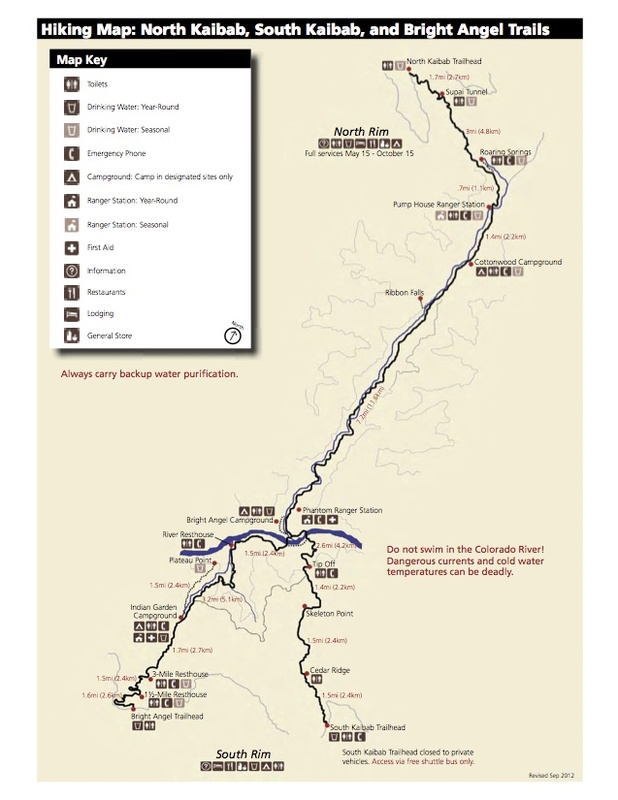 The R2R2R is a run from the South Rim, down to the Colorado River, up the North Rim and then back again. 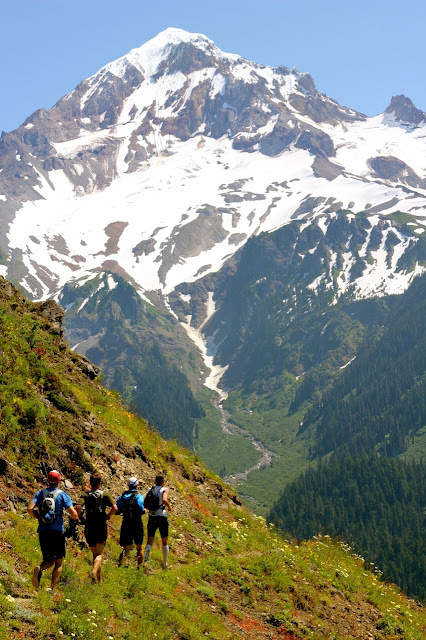 It’s about 46 miles roundtrip with more than 11,000 feet of elevation gain and loss. These guys made it sound like it was a life-altering experience and an absolute rite of passage for ultrarunners. Oh well, so much for the bird watching. With my flight leaving in less than a week I didn’t have much time to work out the logistics or to train for the specific demands of the route. The R2R2R has a little bit of everything: technical trail, exposure, long distance, high altitude, extreme heat, and two huge ascents/descents. But other than that, it’s pretty straightforward. 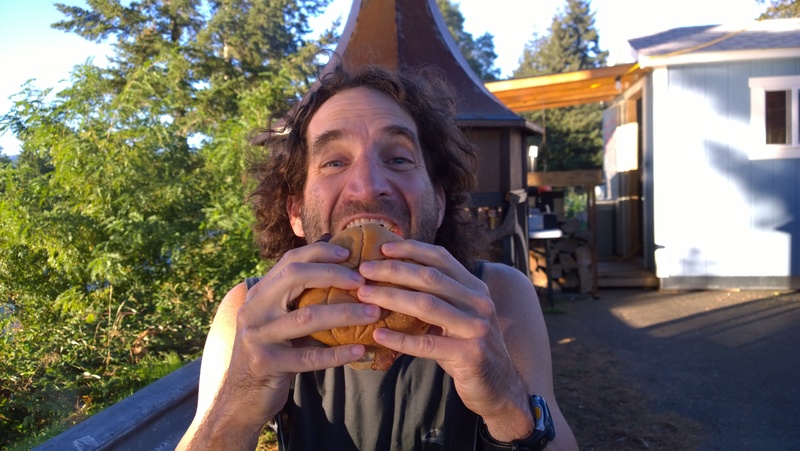 The fastest known time for the route was set by ultrarunning stud, Rob Krar, in 6 hrs. 21 mins. I was thinking (hoping) it would take me about twice that long. 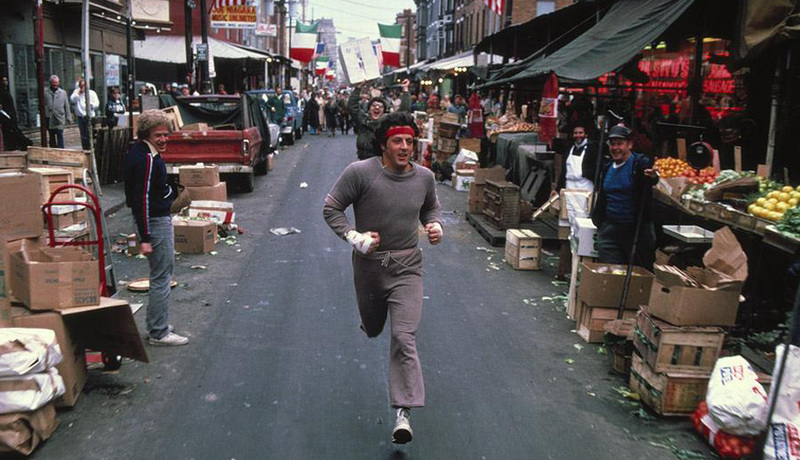 To get a real sense of the scale and beauty of the run, check out this VIDEO. My adventure began on April 3rd (Good Friday) while waiting for the shuttle to the South Kaibab trailhead. The temperature was in the 20’s and I thought I was going to freeze to death in my thin little running shorts and windbreaker. But by 6:30am I was on the trail, slowly warming up and working my way towards the river. 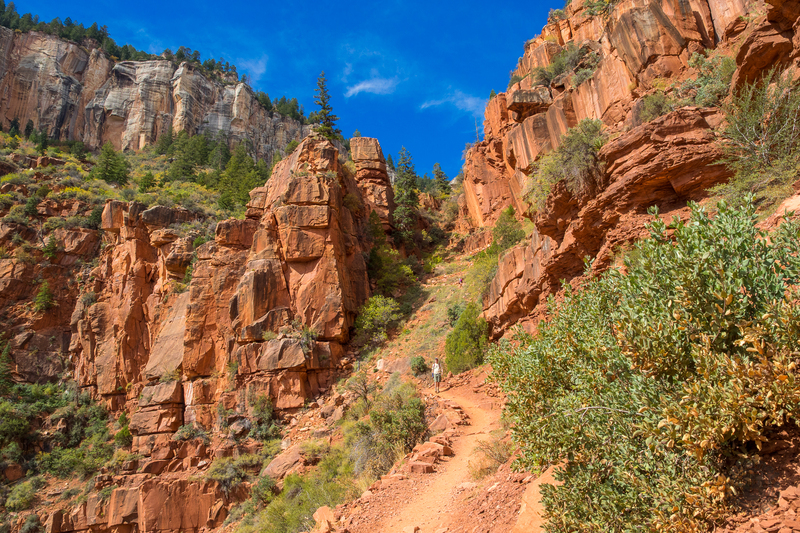 The South Kaibab trail is a steeper more direct route to the river and because it’s along a ridgeline, has 360 degree views. One of the biggest challenges was to NOT check out the view while running. 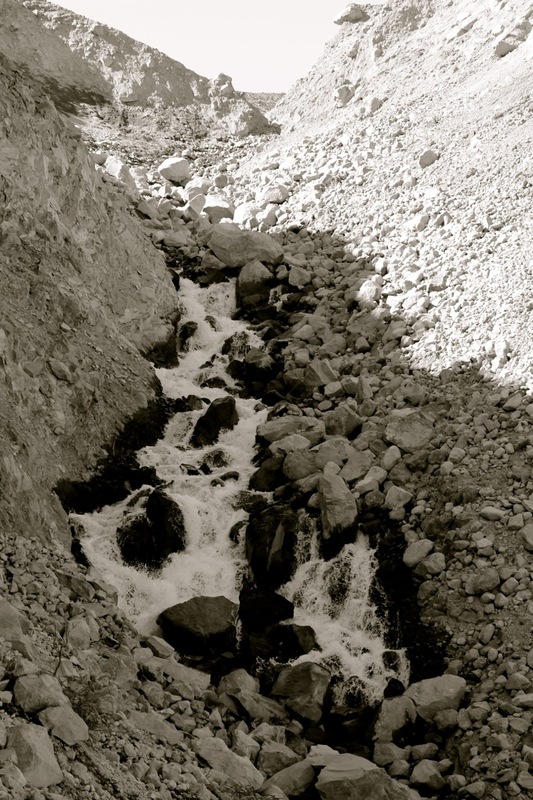 Every step on the rocky trail is a potential twisted ankle, so there would be no multitasking. If I wanted to look, I had to stop. 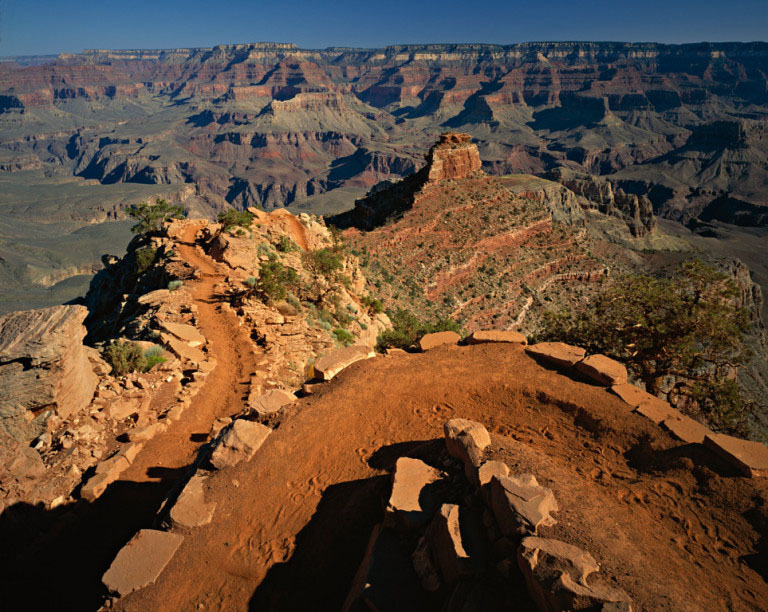 Both the South Kaibab and the more popular, Bright Angel Trail, connect the South Rim with the river. I thought it would be fun to start off with the lesser-traveled South Kaibab and then finish with the Bright Angel, when most of the tourist traffic was done for the day. At about 2 hours I crossed the river and soon thereafter was at the Phantom Ranch, a historic lodge built in 1922. All guests must arrive either on foot, raft or mule. These cool rustic cabins often get booked up more than a year in advance. I was surprised to see they had a little canteen, so I took advantage of the situation and bought some pretzels and a Snickers. From here it was 14 miles and nearly 7,000 feet of elevation gain till the North Rim. Those extra calories would definitely come in handy. This next section was pure bliss: smooth, mostly flat trail winding along an idyllic creek in a narrow box canyon. I got into a flow state and the miles passed easily. After the Cottonwood Campground the grade steepened and I had to switch to power hike mode. As I got closer to the North Rim you could see the flora slowly change from desert cactus to alpine fir and birch. I got to the North Rim in 6 hrs. 30 min. and even though I was pretty wiped out it was a relief to know that I was halfway done. There was still some lingering patches of snow, but I was happy to see that there was running water from the spigot at the trailhead. I chugged a bottle of water to celebrate. It was 14 miles from here to the river, all downhill. My goal was to run at a modest, but consistent pace and not take any breaks. The canteen closed at 4pm and another Snicker would have really hit the spot. It’s funny how the same trail can feel so different just a few hours later. I now had gravity to my advantage, but nevertheless, the cumulative fatigue was starting to take its toll. I never run with an iPod, but this would have been a good time for some inspiring music, maybe Chariots of Fire or the Rocky soundtrack. It was 5pm when I finally arrived at Phantom Ranch. The canteen and their stash of Snickers was closed for the night. And to make matters worse the guests were all hanging out drinking beer while their steak dinners were being barbecued. It was a cruel form of torture. As I crossed the river once again, I told myself that there was good news (less than 10 miles to go) and bad news (all uphill). Plus only about two more hours of daylight. I powerhiked this next section up to the Indian Garden campground, where I met a nice Canadian couple. They gave me a chocolate chip Cliff Bar and told me about a great pizza place right outside of the park. They weren’t sure what time it closed, but if I really pushed it maybe I could make it. It’s a challenge to stay motivated once darkness sets in. Nothing to see, but the bubble of light emitting from your headlamp. 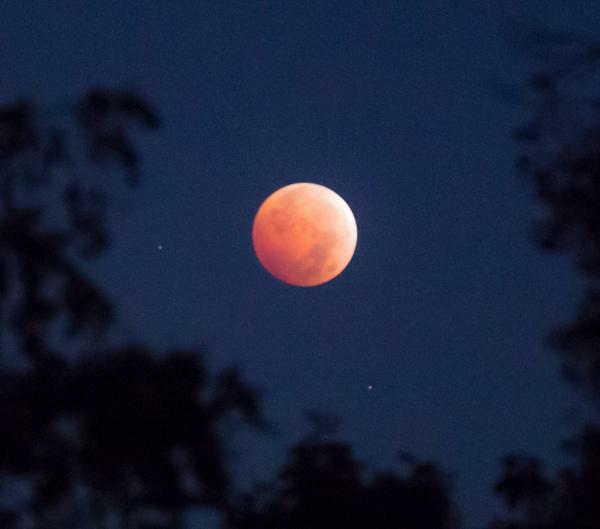 As I got closer to the top, the light from the full moon began peeking over the rim. Eventually it got so bright that I didn’t need my headlamp at all. It’s easy to feel sorry for yourself near the end of the long hard day, but here I was about to complete an epic adventure in the Grand Canyon under the light of the full moon. It doesn’t get much better than that. As I drove into Tusayan, I knew the pizza place would already be closed. The only other choices were Texaco station hot dogs or the ramen back at my campsite. Neither option very appealing. But wait, what is that on the horizon? 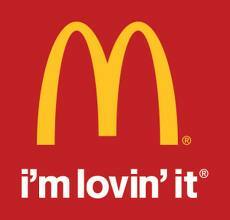 Are those golden arches just a mirage? I hadn’t eaten at McDonald’s in years, but was thrilled to see that it was still open. The Quarter Pounder meal with its savory/salty mix of carbs, fat and protein was just what my body needed. I even went back through the drive thru again to pick up a chocolate shake for dessert. Thank you McDonald’s! You saved my life and I promise to never make fun of you again. The focus of my fifth grade science class was natural disasters and like many kids I thought earthquakes, volcanoes, tornadoes and tsunamis were the coolest things EVER! What was not cool, however, was living in boring western Pennsylvania where none of these crazy catastrophic events occurred. All we had was the stupid Johnstown Flood and that was almost a hundred years ago. 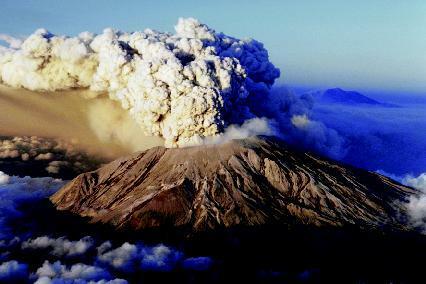 But then right before the end of the school year, Mount St. Helens erupted. 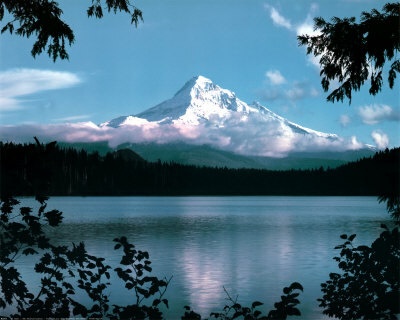 It may have been on the other side of the country, but still, it was an American volcano–the biggest eruption this country has ever seen. Then and there I promised myself that as soon as I was old enough to get a driver’s license, I would go and see this ash-spewing American icon. 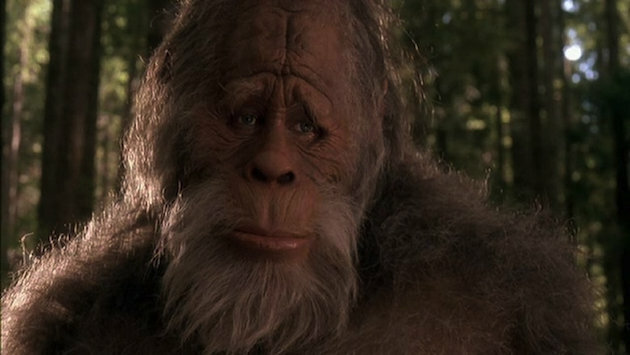 And since I’d be in the neighborhood, maybe discover Bigfoot as well. 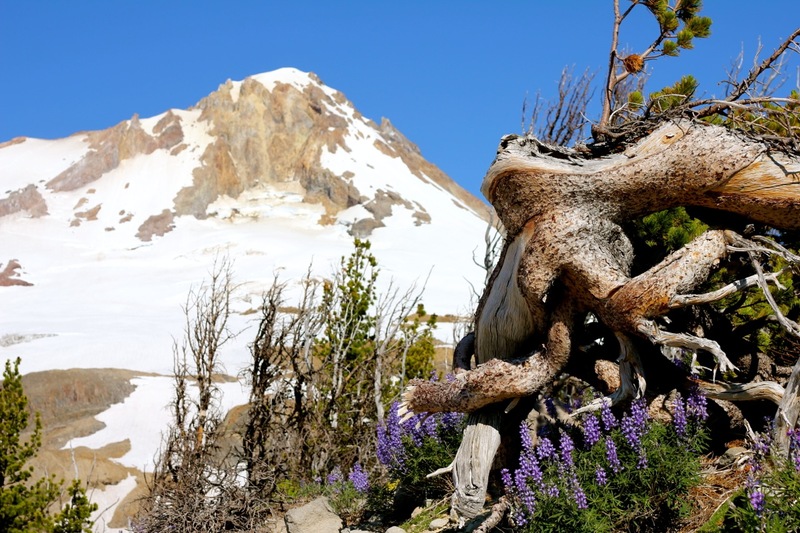 It took a bit longer than expected, but eventually I did move to the Pacific Northwest and have since climbed, hiked and snowboarded the slopes of Mount St. Helens many times (though I never did find Bigfoot). 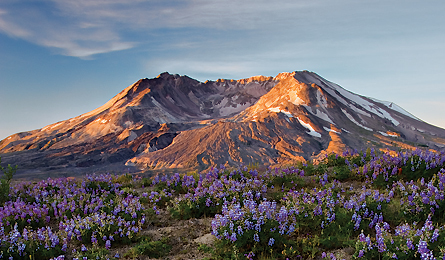 Despite its flattened top, St. Helens is still a beautiful mountain, like a Cascadian Kilimanjaro. On a clear day it’s visible from many parts of Portland and it always makes me smile when it catches my eye. Recently my soul has been craving some form of adventure. Too many 40 hour weeks in an office behind a computer will do that to you. On a run-commute home from work last week, I got a glimpse of St. Helens and thought it might be fun to spend a day running around that bad boy. A few days later I got up at 2am, had quick breakfast and was at the trailhead by 4:30. The excursion started with a short run up to June Lake before connecting to the round-the-mountain Loowit Trail. I touched the trail sign for good luck and paused for a few minutes to decide if I should go right or left. Thinking that it might be best to get through dry and exposed sections before it got too hot, I opted to go counter clockwise. Not realizing at that point that the whole day would be hot, dry and exposed. I got over the first ridge just as the sun was starting to rise. It lit up a beautiful meadow that stretched down to treeline and roused a herd of elk warming up to a new day. Above me a few mountain goats scrambled along crumbling cliffs. It was like being in some type of fairy tale land. The first section of trail goes through an area called the Plains of Abraham. This flat moon-like landscape extends for miles along the eastern side of the mountain. 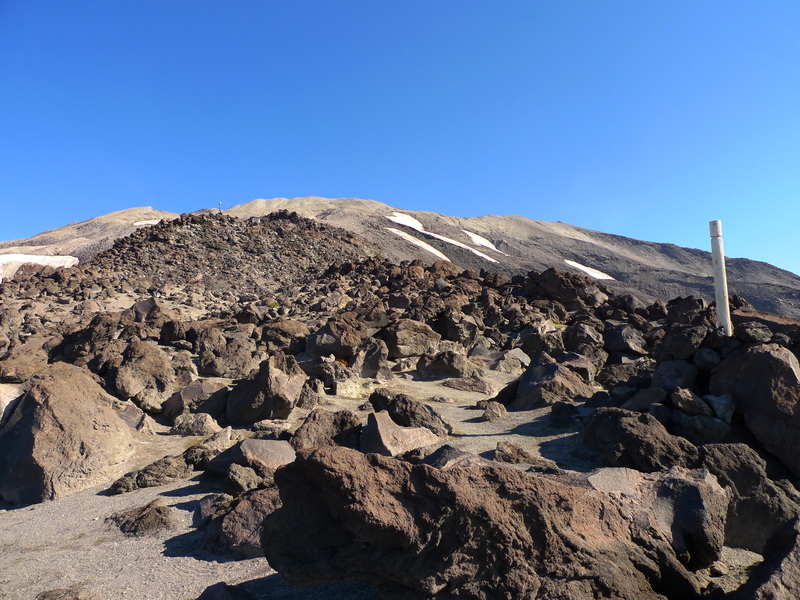 The trail then crosses over Windy Pass, which is in the blast zone, an area still being actively studied by volcanologists. For hours I ran across this vast empty plain. Without any trees or other identifying features you can’t help but feel small and insignificant. The raging Toutle River brought me back to reality. The trail descended more than a thousand feet and then deadended with a steep dropoff down to the river. A tattered old climbing rope tied around a tree was the only indication that this was the right way to go. I rappelled down to the river, filled up my hydration pack and ate my last energy bar. I’d been running for 8 hours and still had more than 10 miles to go. The miles now seemed to drag on forever as the trail meandered through boulder-strewn lava fields. Everytime I looked at my watch another hour or two had passed despite little forward progress being made. I had gone the whole day without seeing a single person and then when I finally did, it was as if I had forgotten all the rules of society. Like I had reverted to some primitive animalistic state. Without thinking I blurted out the first thing that popped into my head, “Do you have any food?” He was a bit taken back by my directness, but then asked me if I liked Fig Newtons. I could have eaten a whole supermarket aisle of Fig Newtons at that point. After scarfing down the cookies, I remembered my manners and learned that he was from Atlanta and was spending a few days hiking around the mountain. He was happy to lighten his load and offered me some more snacks before heading on his way. The Fig Newtons powered me through the rest of the run. 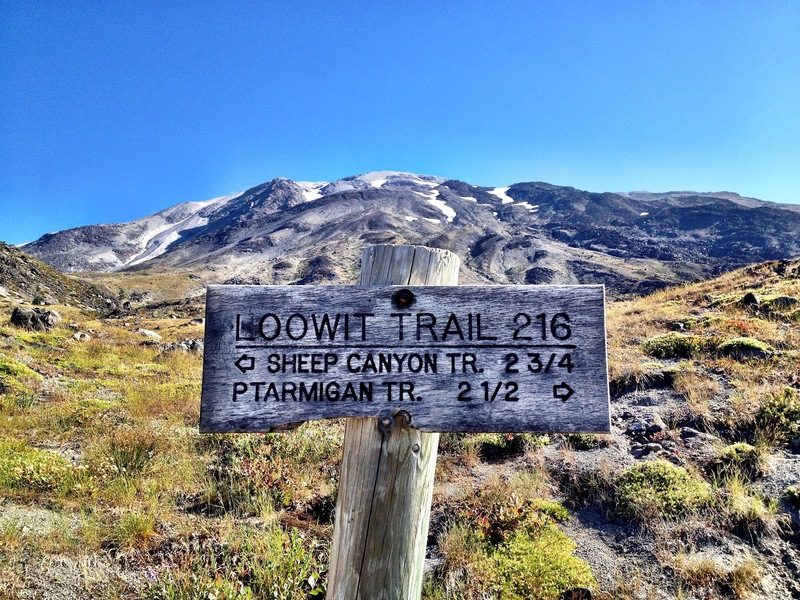 Once again I touched the Loowit Trail sign, this time in appreciation of a safe passage. It had taken me more than 13 hours to complete the loop around the mountain. My soul had been craving an adventure and it most definitely got one. Would I do this St. Helens run again? Probably not. Would I recommend it? Without a doubt. 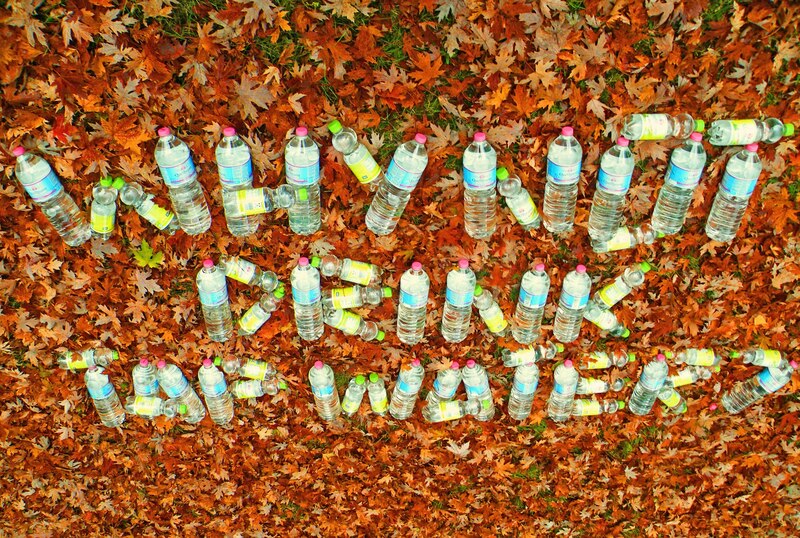 To paraphrase an old Japanese expression regarding Mt. Fuji: It is foolish not to climb Fuji-San, but only a fool climbs it more than once. 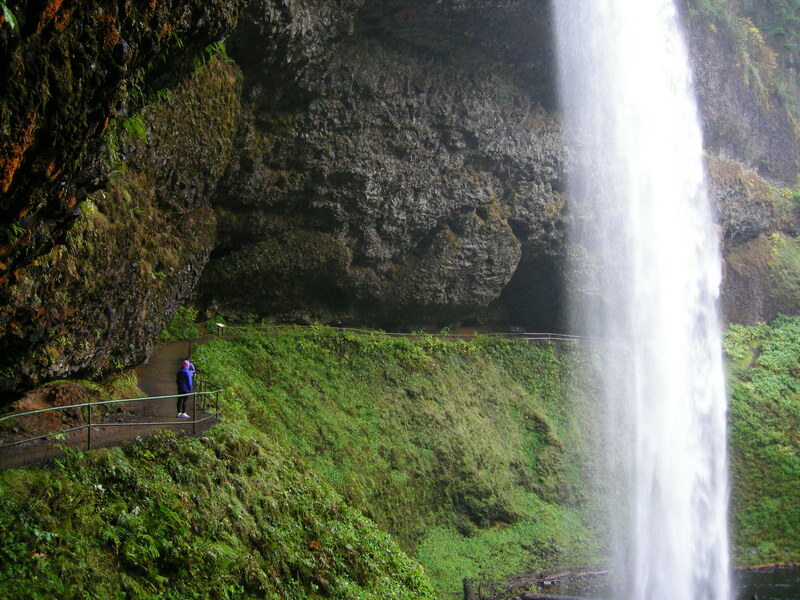 If you’ve never been to Silver Falls State Park, you really should go. 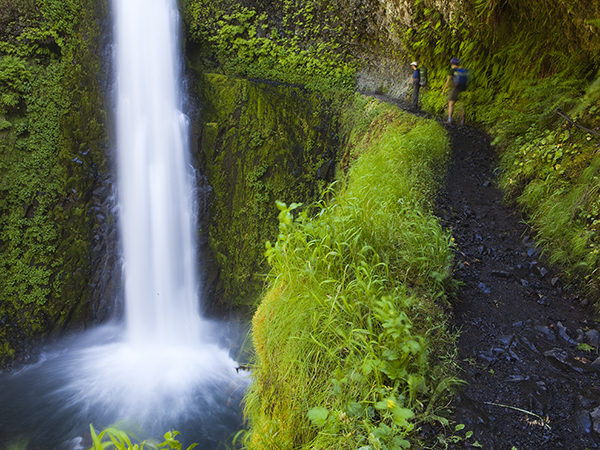 Oregon’s largest state park has miles and miles of single track trail that passes by (and even behind) ten waterfalls–several more than a 100 feet high. 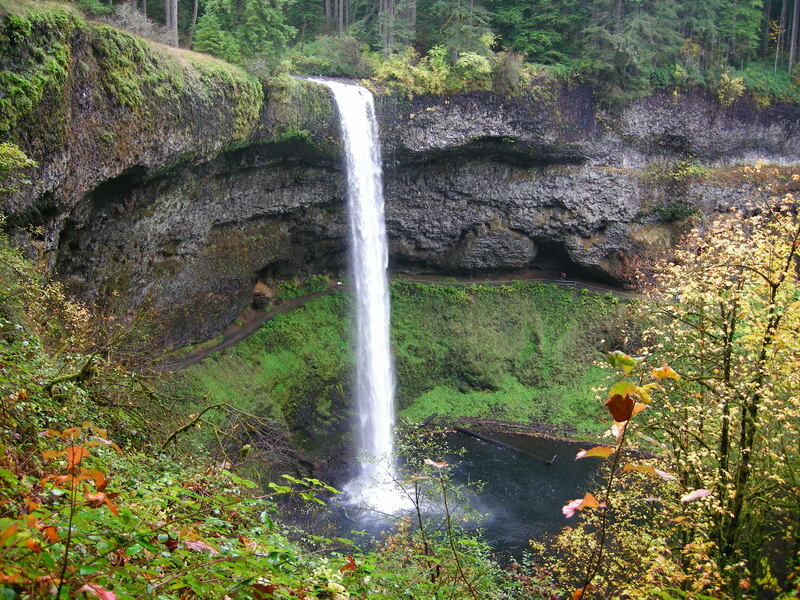 Even though it’s close to both Portland and Salem, Silver Falls is not really on the way to anywhere. Nevertheless, you should make a point to check out this magnificent park, you won’t regret it. Last week I was one of 500 runners to take part in the Silver Falls Trail Half Marathon organized by the fine folks at Run Wild Adventures. Run Wild has just been around for a few years, but already they’ve put together a cool series of shorter trail races that all take place in those dark winter months when there’s not much else going on. At their races, you can expect rain, you can expect mud, but you can also expect to have a real good time. What I didn’t expect was that there’s be so many competitive runners taking part in this second annual event. The sloppy conditions didn’t hold anyone back and right from the gun these guys were cranking it out at a sub six minute pace. The first mile was on road, which the gave the us a chance to spread out a bit. By mile two, most everyone was where they needed to be and for the rest of the race there was very little passing. We looped around to the start area and at about mile four we got on the Rim Trail which took us out to and behind 136 foot North Falls. Even though you’re in the middle of running a race, it’s impossible NOT to stop and marvel at this massive cascade of water. From there we hopped onto the Canyon Trail, which follows the North Fork of Silver Creek for about five miles. This trail was just pure fun, mostly flat, but with lots of twists and turns and a few rolling hills. A trail like this makes running on asphalt seem ridiculous. At Lower South Falls the trail again skirted behind the falls and then climbed up a long, looooong set of stairs. Now I was really starting to feel it and at this point my legs decided to officially lodge a protest. 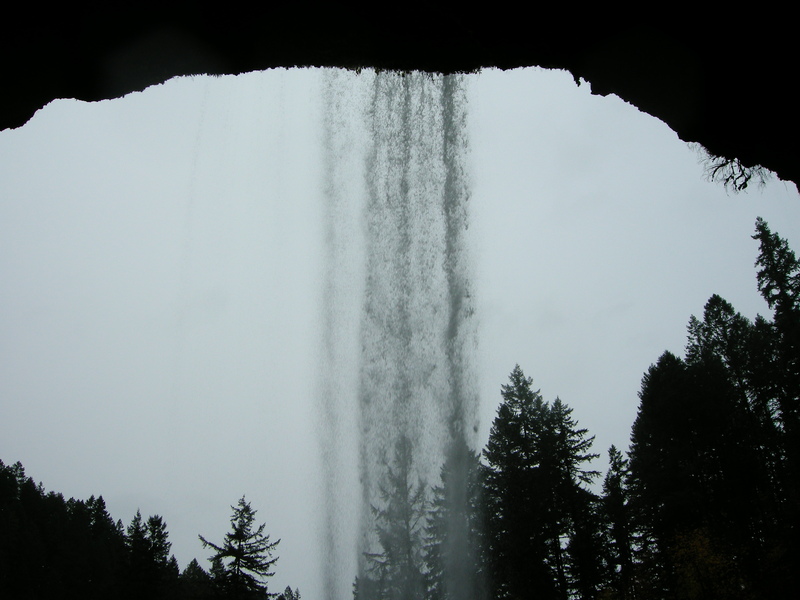 I tried to ignore them as we then passed behind 177 foot South Falls, but they just wouldn’t quit their complaining. “Come on guys,” I pleaded. “It’s only three more miles.” No answer. 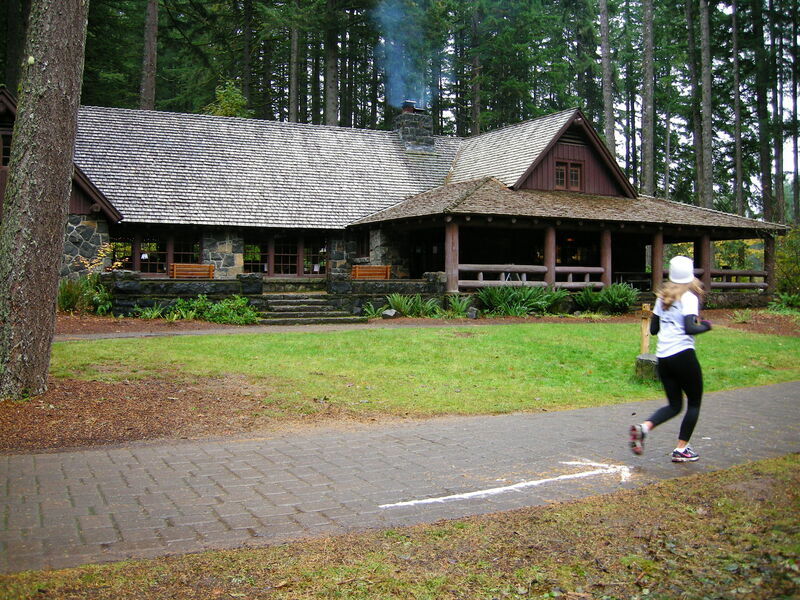 ” Wow, check out Silver Falls Lodge, built in 1940 by the Civilian Conservation Corps. Isn’t that cool?” My legs were not impressed. They told me to quit sightseeing and get this thing over with. I shut up, put my head down and churned through the last couple of miles. Somehow I was able to convince my legs to put forth a bit of a sprint at the finish. They reluctantly agreed, but were not happy about it. Considering the competitive field and the fact my training has been in maintenance mode for the last month, I was happy to finish 25th overall. Afterwards I ran into some guys I met over the summer at different races around Oregon. Summer now seemed a long ways away as we warmed ourselves in front of the fireplace and enjoyed a few bowls of chili. Thank you Run Wild Adventures for organizing such a fun race. I look forward to your Shellburg Falls Trail Run next month. A few months ago Outside Magazine ran an article on America’s Best Trails. I was thrilled (but not totally surprised) to see the Wildwood Trail chosen as the best trail within city limits. The Wildwood is a 30 mile trail that zigs and zags its way along the spine of the Tualatin Mountains in Portland’s Forest Park, one of North America’s largest urban parks. I first become aware of Forest Park soon after moving to Portland in 2000 and was shocked to discover that it is much more forest than park. In fact, it’s much too dense for a game of Frisbee, a summertime picnic or other typical park activities. Forest Park is a full on wilderness experience and all within the city limits. There are more than 70 miles of trails within the park, but the real showpiece is the Wildwood. 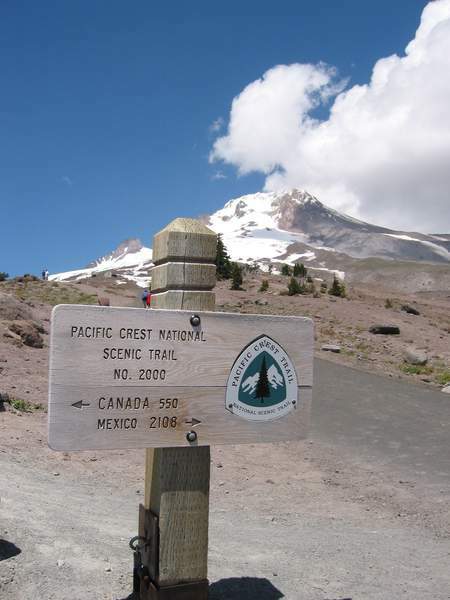 It has numerous trailheads, the closest of which is about 5 miles from my home and just two miles from my workplace. I can access the trail on foot, by bike, bus, or light rail. 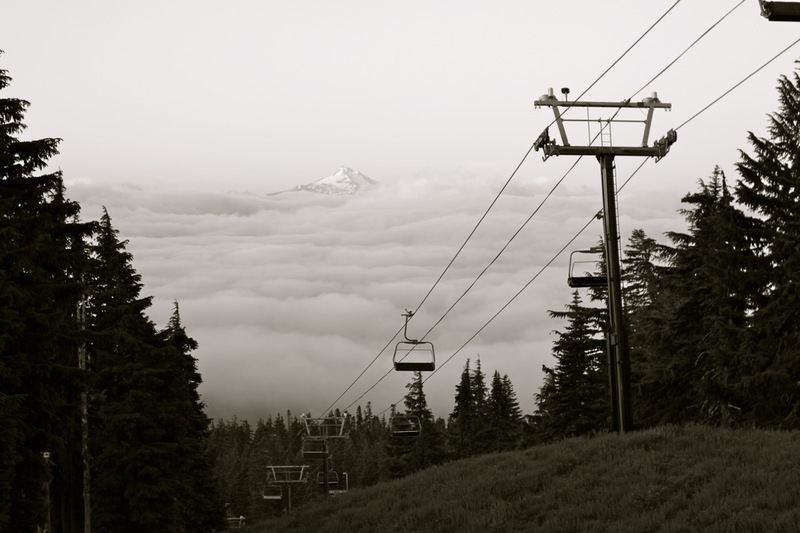 For a trail-running urban dweller without a car, it’s a dream come true. In the last twelve years, I’ve logged hundreds of miles on its hard packed switchbacks sometimes before work, sometimes after, and occasionally even sneaking in a “quicky” on my lunch break. The Wildwood does get a little crowded on weekends and in certain sections, but the further you get from the popular trailheads the less people (and more animals) you’ll see. Once while in the depths of the park I came across a couple of elk. If you’ve never seen an elk before, let me tell you, there’s no mistaking these guys for deer. They’re HUGE. Supposedly there are also bear and mountain lions hiding out in there somewhere. 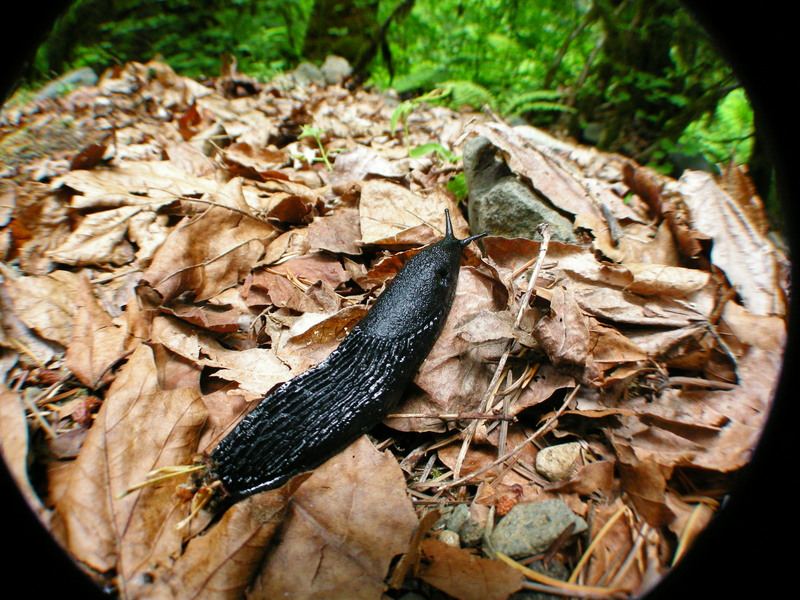 However, if I had to nominate one animal to be the Wildwood’s official mascot, it would have to be the giant slug. These slimy critters use the trail almost as much as runners do and can grow to about half the length of my size 12.5 Sauconys. 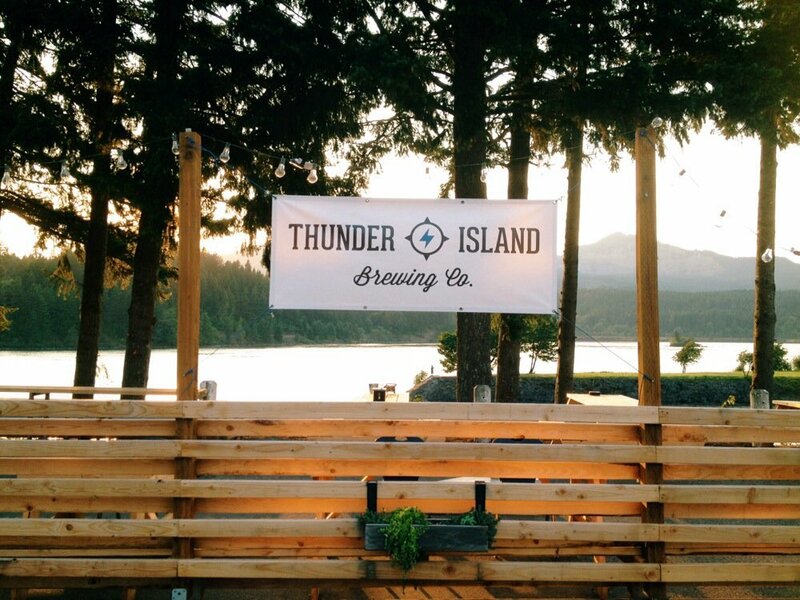 If you live in Portland, I highly recommend checking out this gem of a trail or taking part in one of the races that utilize it. Next month the Oregon Road Runners Club is putting on its annual Wildwood 10K. There is also a 50K ultra marathon in May and for the first time this year, a trail marathon in October. 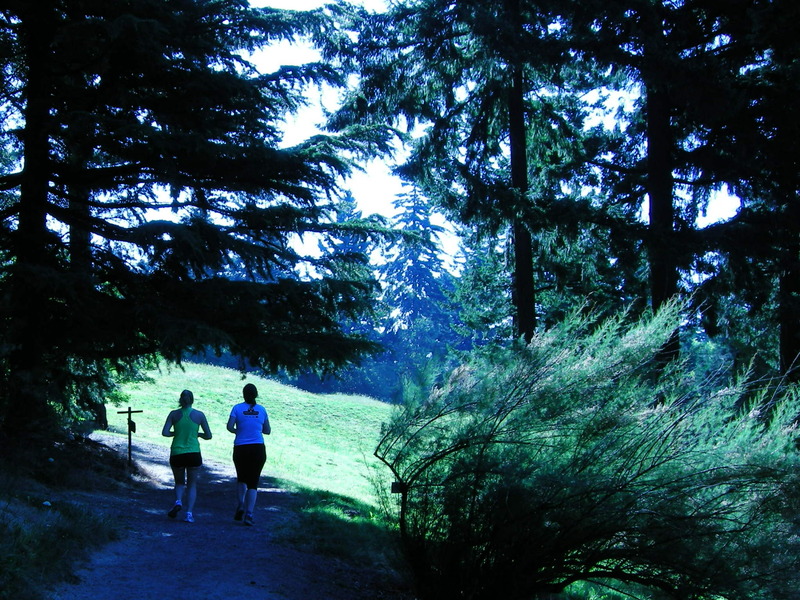 Proceeds from the marathon will benefit the Forest Park Conservancy, the non-profit caretakers of this urban forest reserve. Because of its size and density, Forest Park can be a bit intimidating at first. 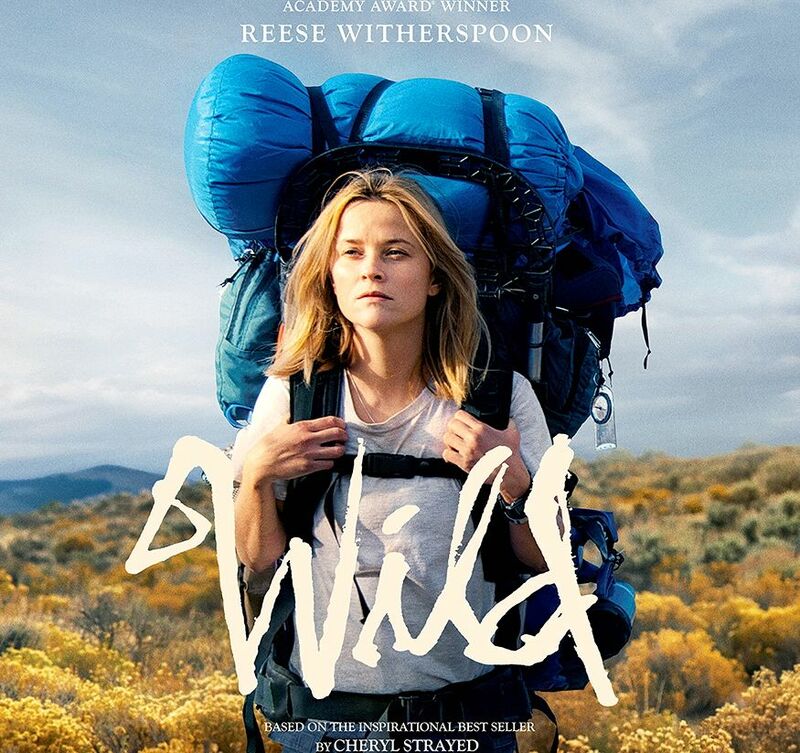 Before diving in, you should pick up one of Green Trail’s waterproof Forest Park maps or a copy of the book, One City’s Wilderness, and then you’ll be all set to get wild on the Wildwood.